Before I even made them, I was so excited about them. But after I made them, the excitement grew times a million. Now that I finally get to tell you all about them I am just ecstatic. I do realize that I sound a little crazy right now. I know these are only burgers, BUT they are really not just any burger. I am deeming these the official burger of summer because they offer some of summer’s greatest treasures. Sorry, I couldn’t resist adding those two. They just scream, “put me with some lobster”. 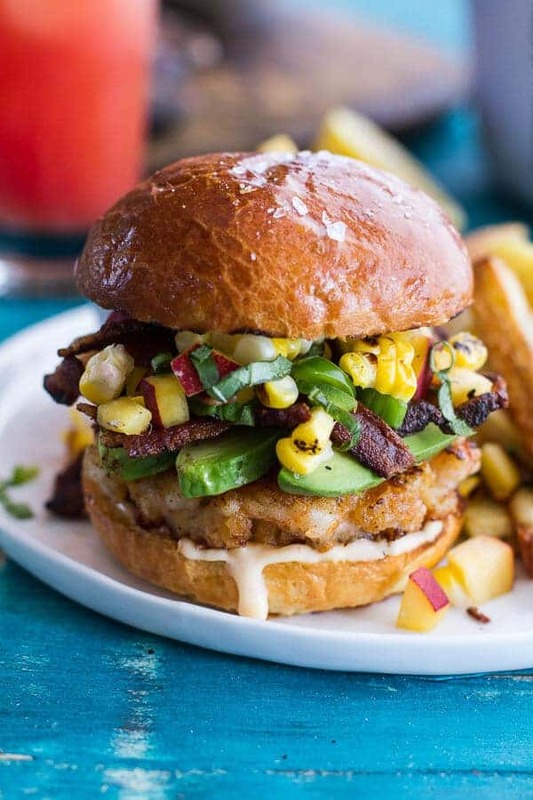 Anyway, let’s talk about how to build this incredible burger. First, you start with the patty. To keep things a little cheaper I used a combo of lobster and shrimp. I think I used more lobster than shrimp, but use what you budget allows. To the seafood, you add some Panko, lemon, a pinch of cayenne and what I like to call the magic ingredient, Gruyère cheese. I swear it makes the patties just melt in you mouth. So good. The only down side to these patties is that I don’t really think you should attempt to cook them on the grill. I actually tried that first and while I was able to get them to stay together, they stuck to the grill a little. It is just a lot easier if you fry them in a skillet. If you have a cast iron skillet, I would put that on the grill and cook them that way if you don’t want to heat up your stove top. After the patties comes the Browned Butter Lemon Aioli. Here is the thing, I normally despise any kind of aioli because mayo really grosses me out, but lately it’s been working for me, and it ESPECIALLY works for these burgers. Like you cannot skip it. Not only does it have browned butter, but it has sweet thai chili sauce making it a little spicy and a little sweet. It may seem odd, but sometimes those odd combos really work and this is definitely one of those times. I promise the aioli is worth making. And now one of my favorite toppings, the salsa. And then of course there’s the bacon and avocado. Can’t skip those either. Oh and we can’t forget the buns. You NEED good buns. I made brioche buns with a sprinkle of sea salt on top and they were perfect. 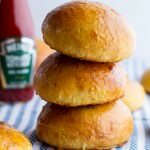 I recommend either brioche, potato or pretzel buns, but I really love the brioche buns! 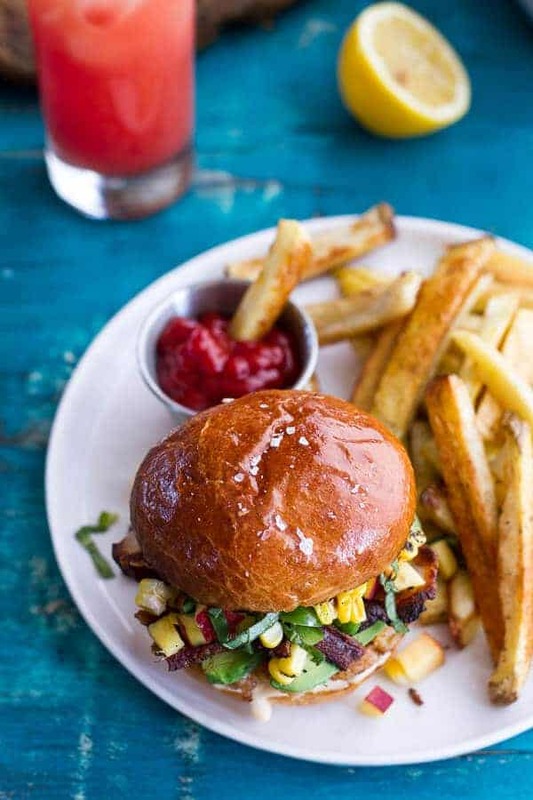 And maybe a side of crispy baked fries too, because what’s a burger without a side of fries? I am deeming these the official burger of summer because they offer some of summer's greatest treasures. Add lobster and shrimp meat to the bowl of a food processor and pulse until it’s somewhat ground. You can also chop the lobster and shrimp very finely with a sharp knife. Remove and add the seafood to a bowl with the Panko bread crumbs, gruyere, lemon zest, cayenne, salt and pepper. Mix with a spoon until just combined. Form into 6 equally sized burgers. 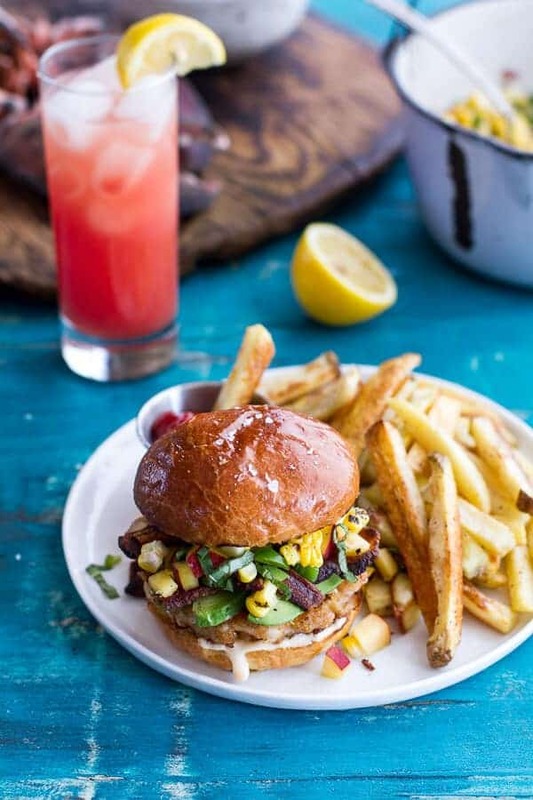 Place the burgers on a plate, cover and place in the fridge for 15-30 minutes. Meanwhile add the mayo, lemon juice, sweet thai chili sauce, garlic, pinch of cayenne, salt and pepper to a medium sized bowl. Stir in the cooled brown butter and whisk until smooth and combined, cover and place in the fridge until ready to use. Spread the bottom of each toasted burger bun with as little or as much aioli as you wish. 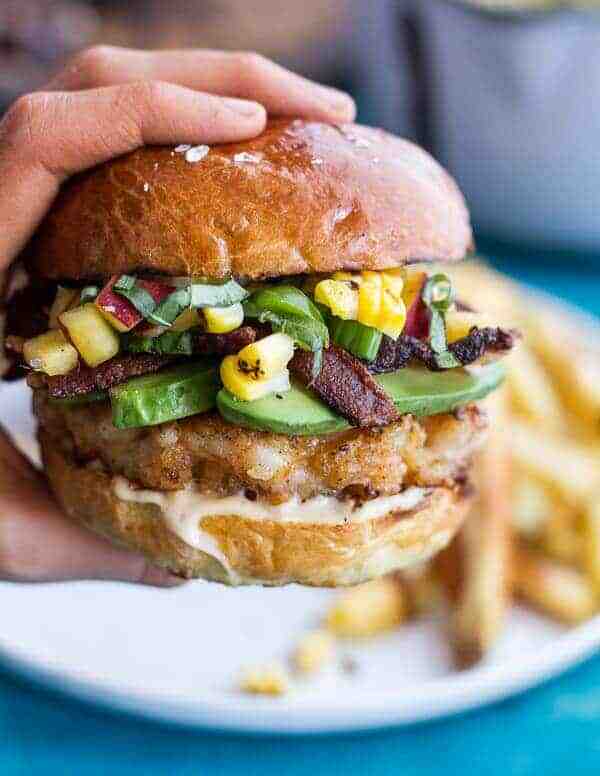 Add the burger patties, sliced avocado and bacon. 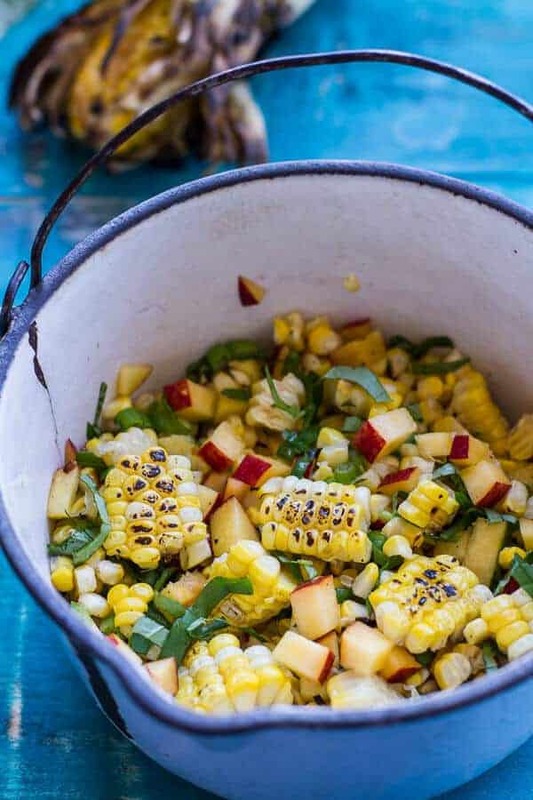 Top that with the Basil Corn + Peach salsa. Add the top bun and dive in! Oh, and an ice-cold glass of watermelon lemonade…or maybe a cold beer. Ahh gotta love summer! 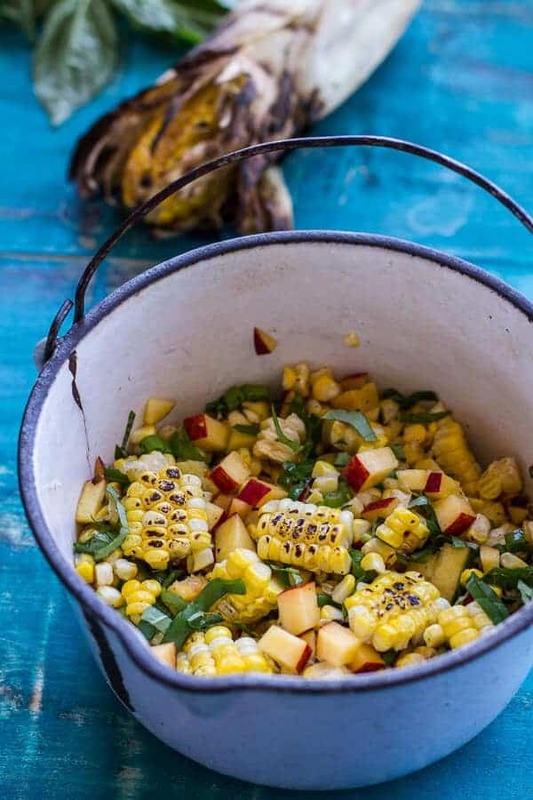 There is so much yum in this here post that I can’t handle it! 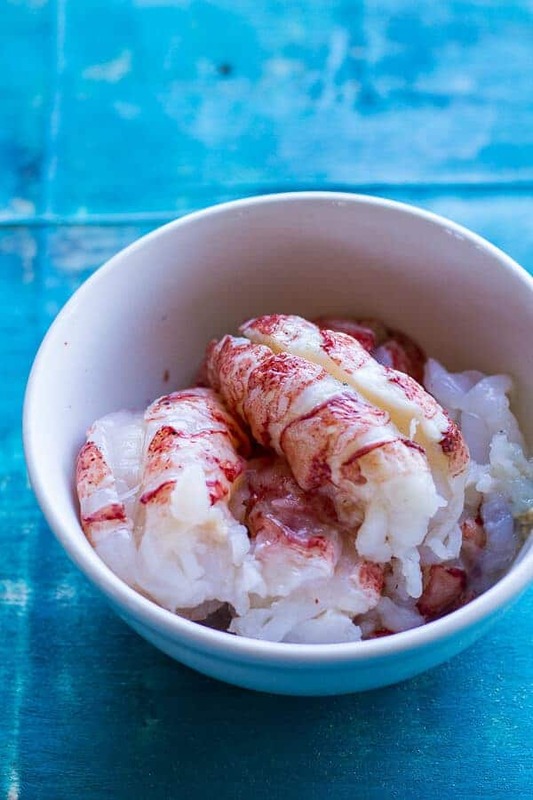 I’ve never actually cooked my own lobster…but I have had it at restaurants and YUM! Plus, avocado and bacon? I put that on all the things! Pinned! This is complete deliciousness going on here. My mouth is watering! I need this for breakfast which may be kind of problematic, but that’s a good kind of problem to have 🙂 Thanks, Tieghan! 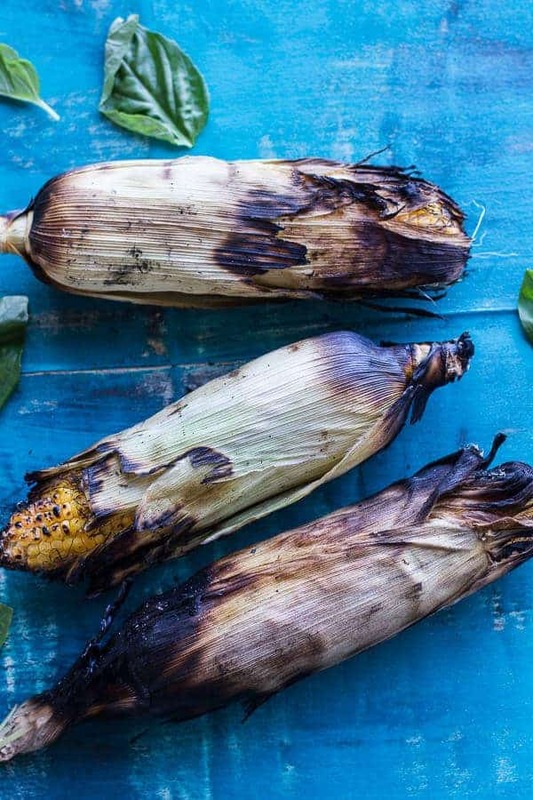 Tieghan, Everything about this recipe looks perfect… Oh my word. You amaze me. 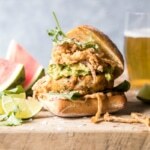 OMG…these are the best burgers ever…i love the idea of lobster as a burger it helps to stretch it so you can feed more people with it and that salsa…I so want to try these. Sounds fantastic, but there’s parmesan in the directions, but not in the ingredient list, I think? Wow, these look absolutely wonderful! Can’t wait to try them! Thanks for all the wonderful posts you put together, I always enjoy them. These are anything but just a burger. These are beyond average–extraordinary is more like it. 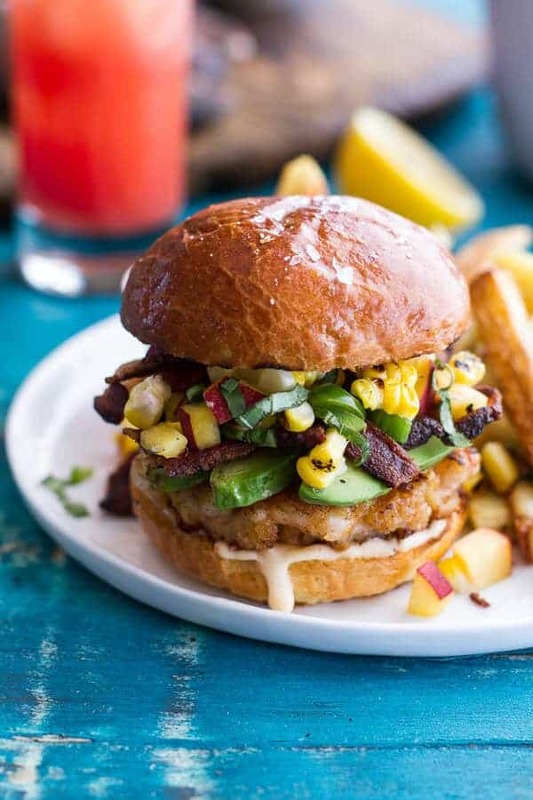 Love everything about this burger. Absolutely gorgeous. 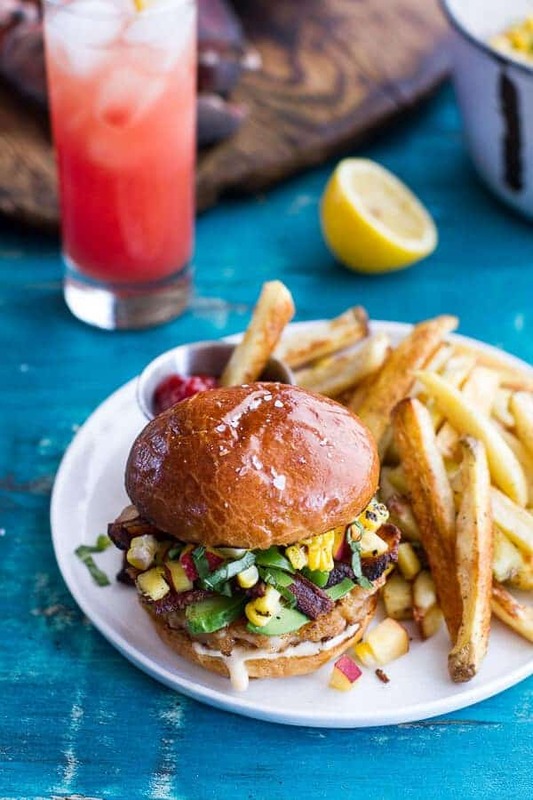 These DEFINITELY are the perfect burger for summer. 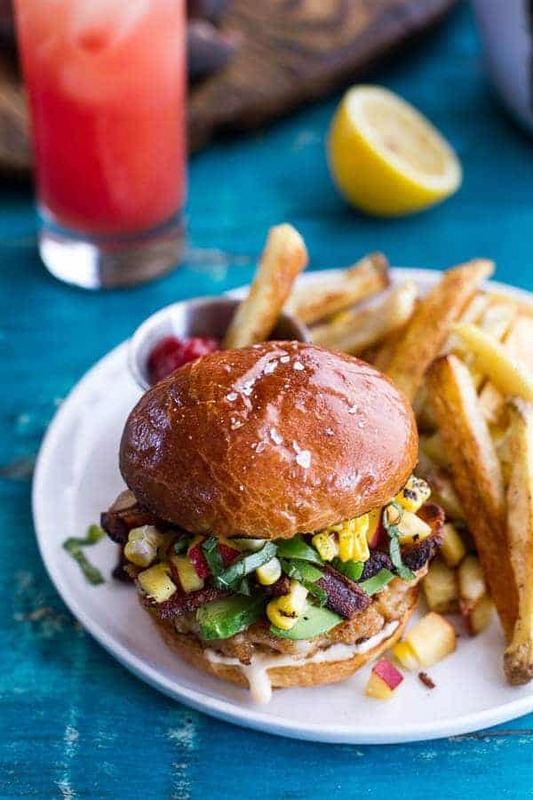 Nothing screams summer like lobster, corn and avocado. And those brioche buns?? To die. Now that is a burger worth a good face stuffing! These photos are gorgeous!! I love how everything just pops against that blue background! I’d love to stuff my face with this burger! 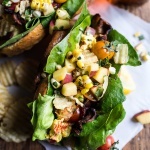 I love the idea of the Gruyere cheese to help bind them together – love! And I use our cast iron skillet on the grill all the time in the summer – that way I don’t have to heat up the oven/stove! THIS is why I love summer. I totally agree with you on the aioli dealio. And that salsa, can I just put it on everything, please?!! I love how your mind works! You are so creative! 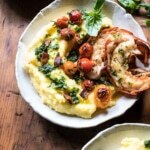 Every last dish sounds amazing, including this one, and I don’t even eat seafood!! I love the whole idea tho so I will have to substitute a little. Awesome ideas here. Damn Tieghan this is AMAZEBALLS! Yummmmmm! Now that is a burger, my friend! I just ate lunch but I know I could find room for one of these beauties! Lady, this burger is probably the best thing I’ve ever seen in my life. MY LIFE. I bow to your genius. These looks AMAZING!!! and the salsa also looks so bomb! I can’t handle all the delicious-ness happening right now! 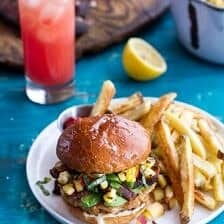 You rare absolutely right, these are the official summer burgers! Beautiful! I accept. I need these in my life. Why on this earth would you ruin perfectly fantastic lobster with all of this other stuff. It needs only one thing. Buttah. Serious deliciousness! I love the layers of flavor (as with all your dishes). As I always say,life is too short to eat bad food. This is now my #1 site to find what I will make for dinner. Thanks ! Aww!! THANK YOU!! Hope you love these! 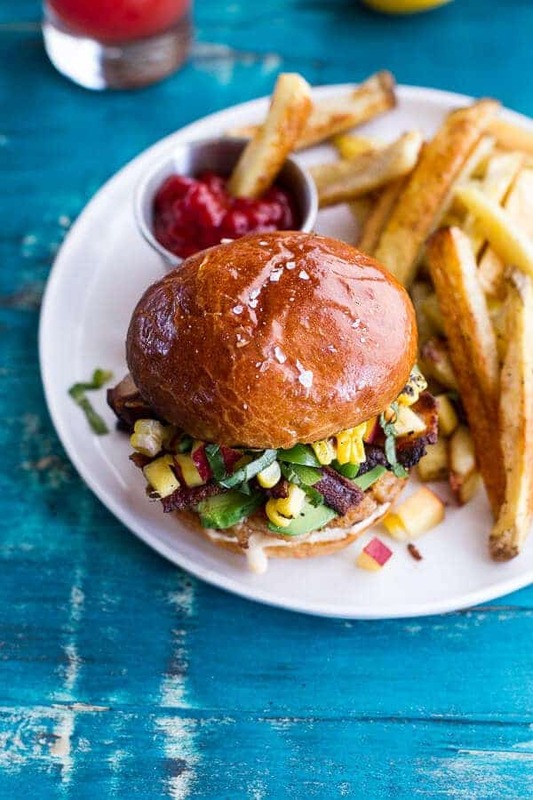 Any ideas on where to purchase gluten free brioche buns or gluten free pretzel burger buns? I haven’t come across them before, but those are some GF products I’d love to try! I would try whole foods and any online retailers like Amazon. I checked both WF and Amazon but could not find any GF brioche or GF pretzel burger buns, so thought you might have had a specific retailer in mind by your description in the ingredients. Thanks though! Hmm, sorry! I have seen some at my local health food store, but maybe they are not widely sold. You can always try making you own though. YUM! Thanks Paul, will have to try these! Found this from the Kitchn, and I just have to say THANK YOU! Made this tonight for dinner, and my husband and I are still in an epic, glorious food coma one of the best meals I’ve ever eaten. Great Lobster Burger!!! Made it last night and will make it again. I added spring onions (scallions) to the patties for added flavour. Thank you for the inspiration. THANK YOU! So excited you loved the burger! Just made this last night and WOW! Burger was great! We actually did make them on the grill but used a grill pan so they wouldn’t break and it worked just fine. Didn’t even need to cook in butter! The salsa was excellent. Will make that again just to eat with chips this summer. Nice work! Hi Kayti! I am so glad you enjoyed these burgers! Thank you so much!